Get Found & Get Booked Through Google! Running a salon or spa is a lot of work and typically requires the help of others to make it happen. Although you don’t want to incur unnecessary costs by overstaffing, you do want to be sure that you have enough help to manage the workload. Consider hiring others that offer a variety of skills. Naturally, you’d want hair, nail or spa service providers with a broad skill set, but consider hiring other necessary staff with writing and office skills or a background in marketing, design, social media management or even public relations. This will allow you to delegate some of the work that owners tend to take on themselves. No matter how large or small your staff may be, always have a set of hiring and training guidelines and employee policies set for everyone to follow. When it comes to hiring employees, set a standard for what sort of experience and traits you expect in a person for each possible position in your salon or spa. Outline the procedure for taking applications, interviewing, hiring, and training. Inform your front desk and anyone in the office that may receive calls what the policy is for open positions and then stick to these policies, so others take them seriously. 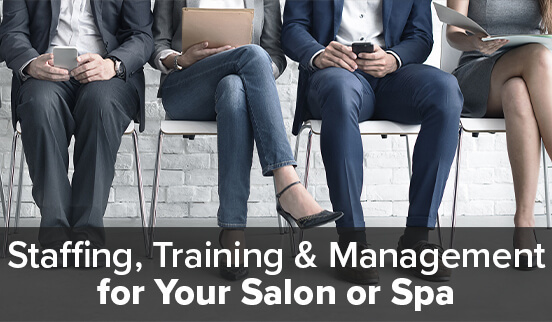 As important as it is to find the right person to fill each position in your salon or spa, having a set of rules and guidelines for employment is just as vital. If you, the employer, don’t explicitly outline what’s expected of the employee and set certain boundaries, then you have yourself to blame when the new team member steps over the line or does not know what to do with themselves. Set up a written policy for training a new staff member based on their position and set the time aside to train them adequately. Let them know when they are expected to work, when and where they should take their breaks, what their duties are, how to use specific equipment (if they don’t already know), who to report to, and who to ask should they have a question. Even outline extra tasks that they can do should they ever find themselves with downtime. This is also a good point at which to outline your salon or spa dress code and customer service expectations. For every new worker, go over a detailed and predetermined code of conduct that is expected in your business and explain to the new hires what you consider to be grounds for termination. Be very clear and concise in all such matters. You may even wish to have a checklist to work off of that you both can review and sign accordingly. When you put together your salon or spa policies and procedures, consider having a qualified human resources consultant or even your attorney review your documents. To avoid any chance of a lawsuit later, you want to be sure that your policies and requirements are both realistic and legal for your area. Since most lawsuits against salons or spas involve an employer/employee dispute, pay the added expense for professional advice to protect your yourself and your business the best that you can. A manager’s job is to delegate responsibilities, motivate workers to perform and then inspect their progress and/or accomplishments without micromanaging them. You can manage effectively by training workers well, using an incentive-based rewards system, keeping the lines of communication open, leading by example, and always having a positive, can-do attitude. If your workers do not respect you or are afraid of you, they will not perform well in the long run. It’s a simple fact that your staff will not be as motivated or dedicated to your business as you are. You want your passion and enthusiasm for the business to be contagious but your team may perceive things differently. The reality is that by not having a stake in the company, there’s just not as much in it for them as there is for you. It is, however, possible to motivate your employees without giving up shares in the company. Rosy Salon Software was founded by former Salon & Spa owners to develop common sense management solutions specifically for Salons & Spas. We are fully committed to help grow your business! To provide full-featured salon and spa management Software as a Service (SaaS) to the beauty industry that leverages the latest technology and allows users to build deeper relationships with clients while increasing their revenue and profitability. Create your new salon site today!